I have to tell you, even though my girls are only in kindergarten, I am coming to love the school uniform. So far, it has been time-saving and even decision-saving to have that kind of a boundary on what my girls can put on before heading to class. Though school uniforms vary greatly from school to school, families can still outfit their kids in those nifty polos and khakis without feeling like they're paying another full tuition. Here are some tips to get you started on saving moolah on school uniforms. Imagine bins upon bins full to overflowing with gently used school uniforms for both girls and boys in all sizes just waiting for parents to take what they need and can use for their kids' school uniforms. Families whose children have outgrown uniforms can donate them to the exchange and pick up "new" items. This uniform exchange is a great option my girls' school made available to all of its students and has accounted for over half of my girls' uniform wardrobe. Check to see if your private school has this kind of option available to help stretch your uniform budget. If there is no such exchange, put it to the organization's PTA to start one. It truly will benefit everyone! Another way to grab some uniform essentials is to head out to your local thrift stores and consignment shops. I've actually had some good luck in my region, nabbing some blouses for right around a buck, a few nice sweaters for a few dollars and some much-needed pants at great prices. What's nice about these kinds of places, too, is that discounts can often be had on top of the already slashed prices. A local thrift store might have 50% off a certain tag's color while consigment shops might have varying savings, also based on a tag's color. Ask a friend to be your eyes at the local shops! Sometimes, there might not be enough time in a busy schedule to get around to all of your area's thrift stores or consignment shops. This is where you can ask your friends and family, especially those who routinely go to these places, to keep an eye out for uniform needs for you. You could even provide a simple list of guidelines that detail colors and sizes needed. Again, trekking to all area stores and sifting through often-messy bins and racks of marked-down clothes can be too time consuming and just not possible. Plus, near the start of the school year, many uniforms are not even on sale, much less clearance. I have found that a few online stores, however, have had some items that would work for uniforms on clearance during the late summer. So keep your eyes peeled for those kinds of deals. Even if they are out of the size you need now, snag the next size up for the future. Also, a good time to physically check the clearance racks for uniforms is when Christmas shopping is in full swing, say late November through mid-December. 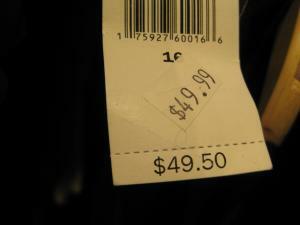 Again, stock up for the next year if you find larger sizes; a pair of pants for $3 now beats paying $15 in August! Outfitting your private-schooler in uniforms needn't break the bank; try a few of the tips above to help save money on your student's clothing budget. As a kid I thought having school uniforms would be a form of torture. As a parent I wouldn't mind it at all! !